METALLIC TONES™ Interior present a sleek, luminous finish that lends a shimmering richness to classic colors and introduces a timeless luxury to walls, trim and architectural elements throughout your home. All surfaces must be sound, dry, clean and free of oil, grease, dirt, mildew, rust, form release agents, curing compounds, loose and flaking paint and other foreign substances. Wash walls before painting and rinse well. Glossy surfaces must be dulled by sanding to ensure proper adhesion. Remove sanding dust. Fill all cracks and nail holes with crack filler and spot prime with the appropriate primer. For best results, prime heavily stained areas or watermarks with a stain blocking primer. Tape off all areas to be painted. Stir paint thoroughly before use. New and previously painted surfaces should be primed with the appropriate latex primer prior to applying paint. See primer label directions for specific instructions. Do not apply when the surface or air temperature is below 50ºF (10ºC). COVERAGE: One gallon (3.78 L) will cover approximately 200 sq. ft. (18.6 sq. meters) with two coats. Do not thin. 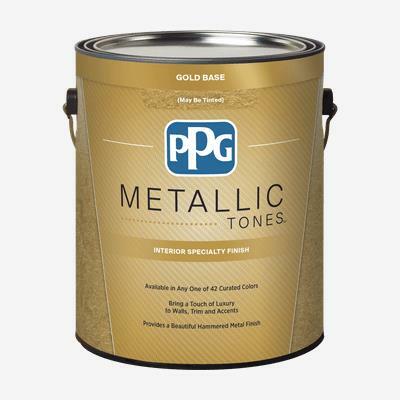 It will take two coats to achieve the look of METALLIC.